As for all other planets, including our Moon, Venus shines by reflecting the light of the Sun. 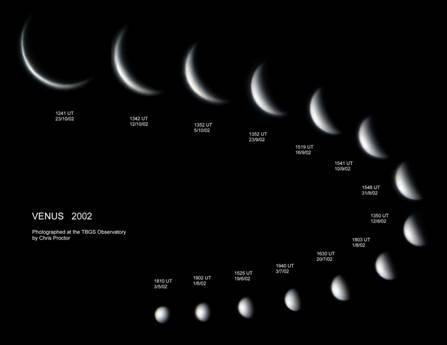 In fact, since its orbit is inside that of the Earth, Venus displays phases much like those of the Moon. Galileo (portait by Giusto Sustermans) was the first astronomer to notice this phenomenon, using a telescope, which allowed him to confirm that the planets are bodies like the Earth. 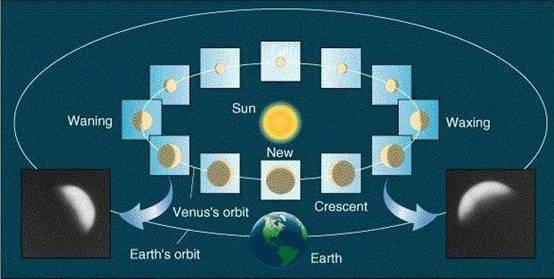 The phases of Venus could not be explained by Ptolomy’s system centred on the Earth. The major difference with the Moon is that, due to the significant changes in distance between Venus and the Earth, its size seems to change considerably, unlike the Moon. Haec immatura a me iam frustra leguntur o y which should be read as: Cynthiae figuras aemulatur mater amorum, or : "The mother of love [Venus] imitates the figures of Cynthia [the Moon]." Another difference between the phases of Venus and those of the moon is that, seen from the Earth, it is not normally possible to see Venus as ‘full’ because it is than on the other side of the Sun (at superior conjunction and very close to the Sun in the sky). Venus is brightest when we see it as a crescent. This is the case when Venus is in the evening sky and is at its maximum distance (called greatest elongation) from the Sun. When we see Venus in the morning sky, it is brightest just before the greatest elongation.